Public Lab Launches a Kickstarter for the Infrared Photography Project Public Lab uses Kickstarter to kick-off a new community of practitioners interested in infrared photography. 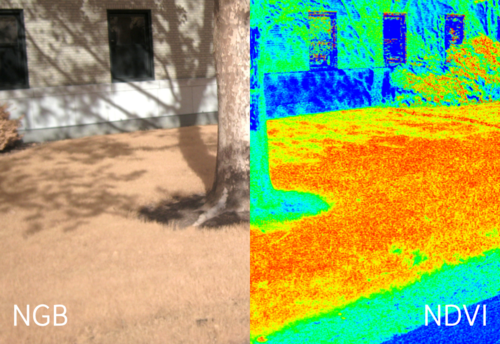 NEW ORLEANS, LA-- The Public Laboratory for Open Technology and Science (Public Lab) has launched a Kickstarter campaign to introduce a new civic science tool: Infragram: the Infrared Photography Project. The Infragram camera, which starts at $35, is a simple infrared webcam that can be used to measure plant health--one-twentieth the cost of normally priced consumer infrared cameras. Originally developed to monitor wetlands damages in the wake of the BP oil disaster, the Infragram's easy to use and modify open-source hardware and software make it a useful tool for home gardeners, hikers, makers, farmers, amateur scientists, teachers, artists, and anyone curious about the secret lives of plants. There will be three different versions available during the Kickstarter campaign: a $10 DIY filter pack, a $35 webcam version, and a $95 standalone point-and-shoot model. Public Laboratory will also be hosting an open online archive where Infragram users can post, share and analyze their images. To help Public Lab advance the campaign and build a dedicated group of supporters, the John S. and James L. Knight Foundation is providing matching donations. Matching support is structured to encourage more backers to help Public Lab continue to grow their community of supporters. Knight Foundation will award: $2,500 when the project achieves 250 backers, $5,000 at 500 backers and $10,000 at 1,000 backers. Knight's contributions will be made as a direct grant to Public Lab. Just as photography was instrumental to the rise of credible print journalism, inexpensive, open-source data-collection technologies democratize and improve reporting about environmental impacts. Infragram allows regular folks to monitor their environment through verifiable, quantifiable, citizen-generated data. The Infragram Kickstarter comes on the heels of a successful 2012 Kickstarter campaign that launched the Public Lab DIY Spectrometry Kit into wide popularity and has opened up the possibility of people using low-cost spectrometers to identify environmental contaminants. About the Public Laboratory for Open Technology and Science The Public Laboratory for Open Technology and Science (Public Lab) is a community which develops and applies open-source tools to environmental exploration and investigation. By democratizing inexpensive and accessible "Do-It-Yourself" techniques, Public Laboratory creates a collaborative network of practitioners who actively re-imagine the human relationship with the environment. The core Public Lab program is focused on "civic science" in which we research open source hardware and software tools and methods to generate knowledge and share data about community environmental health. Our goal is to increase the ability of underserved communities to identify, redress, remediate, and create awareness and accountability around environmental concerns. Public Lab achieves this by providing online and offline training, education and support, and by focusing on locally relevant outcomes that emphasize human capacity and understanding. For more information, please visit http://publiclab.org. About the John S. and James L. Knight Foundation The John S. and James L. Knight Foundation supports transformational ideas that promote quality journalism, advance media innovation, engage communities and foster the arts. The foundation believes that democracy thrives when people and communities are informed and engaged. For more, visit www.KnightFoundation.org.